Wood and concrete offer interesting combinations for contemporary architecture and modern interior design and decor that feels strong and warm, safe and attractive. Natural stone and concrete interior design elements blend well with warm wooden floor, ceiling and furniture, creating this peaceful and pleasant modern house design. Wood and concrete house design project was developed and completed in 2007 by the architectural studio Martin Gomes Arquitectors, www.martingomezarquitectos.com/ based in Punta del Este, Uruguay. 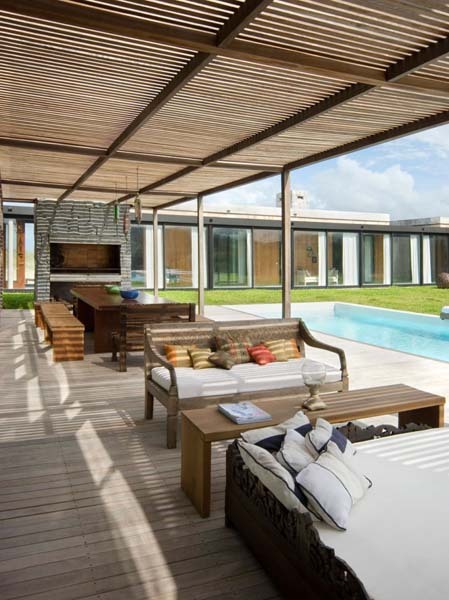 La Boyita Residence, located in La Boyita, Punta del Este, provides 6, 450 square feet of contemporary living spaces. Beautiful views, wood, concrete, stainless steel and glass material combination, striking architecture and contemporary interior design ideas, outdoor pool with lighting, protected from the wind and attractive patio, light living room furnishings and carved wood furniture in the dining room are main takeaways from this modern house design project. With a unique plot, due to its size, location and views, the owner could only dream for a relaxed and peaceful summer house. In order to satisfy his demand we decided enhance its views while protecting its outdoor areas. The gallerias that surround these concrete blocks end up creating the idea of outdoor rooms and a fluid transition between the house exterior and interior design with a fantastic panoramic view. 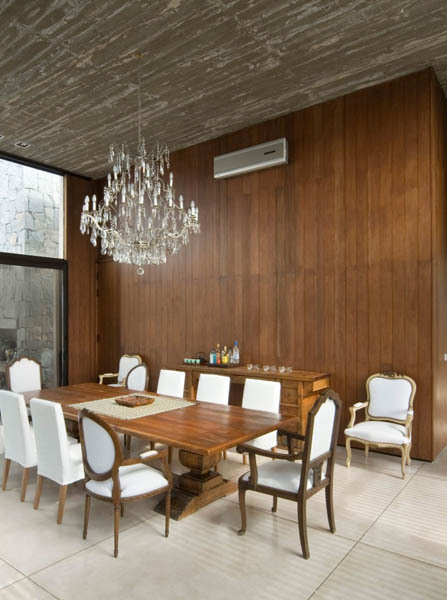 The materials used are concrete, wood, iron and glass.